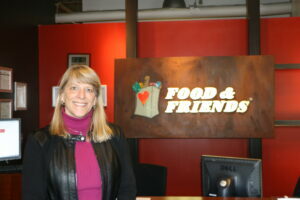 November 11, 2016–Food & Friends announced today that Carolyn Schmidt will join Food & Friends as Chief Development Officer on December 5th, 2016. Started in 1988, the nutrition services organization delivers free, medically-specialized meals and groceries to DC area residents living with HIV/AIDS, cancer or other serious illnesses. Ms. Schmidt has over 29 years of results-driven fundraising and non-profit management experience working for international, national and regional organizations in social services, higher education and literacy. She is joining Food & Friends from SOS Children’s Villages-USA, Inc., where she oversaw major and planned giving. Before SOS, she held leadership positions as Managing Director of Development for Prevent Cancer Foundation, Director of Development for Reading Is Fundamental, and was Director of Operations for Catholic Charities Foundation of the Archdiocese of Washington. Ms. Schmidt is a Certified Fundraising Executive (CFRE) and an active member with the Association of Fundraising Professionals. She believes in cultivating a culture of philanthropy throughout an organization and is committed to fostering relationships with donors who become long-time philanthropic partners. She and her husband live in Arlington, Virginia. She has two adult children – a recent graduate of James Madison University and a student at the University of Mary Washington. The search was conducted by Sterling Martin Associates. ABOUT FOOD & FRIENDS: Food & Friends is a Washington, D.C.-based nonprofit organization that provides home-delivered, specialized meals and nutrition counseling to people living with HIV/AIDS, cancer and other life-challenging illnesses. Food & Friends’ services are free-of-charge to recipients who qualify solely based on their health status and nutritional need. Monday-Saturday, including holidays, staff and volunteers deliver to 5,300 square miles including the District of Columbia, seven counties in Maryland, and seven counties and six independent cities in Virginia. Since 1988, Food & Friends has delivered more than 20 million meals to nearly 30,000 individuals. For more information, please visit www.foodandfriends.org, Facebook (/foodandfriends), Twitter (@foodandfriends) or Instagram (@foodandfriendsdc).